11.00 Hearse arrives at Pier Cottage for transfer to "Ruskin" ferry boat. This is to be a private area.Only Coffin Bearers,Gordon,And hearse driver.The ferry will sail down the lake to the crash site and return to Lake Road (Bluebird Cafe). 12.15 Approx. Ferry will dock and coffin transfered to horse drawn hease to arrive at St Andrews Church at 12.50. 14.15 Flypast of four Tornados and unvailing of temporary marker stone,the final stone is expected to be unvailed next April,( with the temporary stone being re located by the lakeside pier subject to Lakeland Council approval). 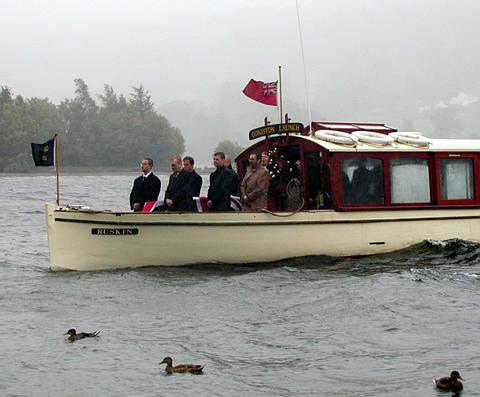 Donald set off to complete his final journey aboard the "Ruskin" ferry on an overcast rainy morning to the sound of a lone piper. The pall bearers standing on the deck alongside the casket. After reaching the crash site the boat returned to Lake Road by the Bluebird Cafe, where he was tranferred to a horse drawn hearse. He then slowly made his way up the road lined with people, the schools pupils also paid their respects, amongst visitors and villagers, all braving the driving rain. When the hearse reached St Andrews church, Donald was carried into the church. The service was relayed outside to the large number of people who came to pay their final respects. After this the appropriate "Speed your journey" by Verdi was sung by the choir, prior to prayers. This was followed by a hymnal version of "Who would true valour see" from Pilgrims Progress by John Bunyon. After this a personal tribute was read by Robbie Robinson, in which he talked about Donald and his life and times in the village. This was followed by a moving performance by Steve Hogarth of Marillion, of their track "Out of this World". There then followed a version of the hymn "The Strife is O'er, the battle won" Before the Commendation and farewell and blessing before Donald was again taken by Hearse to the graveyard to be laid to rest at last. Despite a valiant attempt by the Tornado Pilots, the weather thwarted their attempts at a fly past.